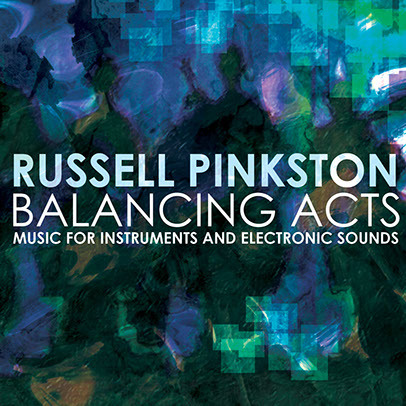 The balance alluded to in the title of this collection of recent work by composer Russell Pinkston is that between acoustic and electronic sounds. Both are well represented here, separately and in conjunction with each other. Pinkston (b. 1949) teaches composition at the University of Texas, Austin’s Butler School of Music, where he also directs the electronic music studios. His eclectic background includes studies with Jon Appleton, Mario Davidovsky, Chou Wen-chung, and even a time spent playing—as a quite good guitarist–in a progressive rock band in the early 1970s. In addition, he’s played an active role in founding and administering institutions dedicated to electronic music. Orb Spells, the longest track on the CD, is a multi-movement work for electronics composed for the Sharir + Bustamante dance company in Austin. Inspired by the rhythms of Hindustani classical music, the piece intersperses interludes of synthesized tabla between sometimes somber, sometimes lush, passages scored for simulated orchestral instruments. Full Circle is another multi-movement piece, this time for the acoustic quartet of oboe, clarinet, bassoon and piano. A pulse-centered work, it carries echoes of Minimalism throughout but especially in the seven-beat based first movement. Lizamander, a composition for flute and computer written for flutist Elizabeth McNutt, is paradigmatic of Pinkston’s tight integration of electronics with solo acoustic instruments. The piece, performed here by McNutt, has a semi-improvised, elastically-phrased sound built around tremolo, overblowing, air notes and other extended techniques which are seamlessly used to round out more conventional playing. The piece centers around the interplay of the acoustic instrument and the computer program, which creates melodic and rhythmic counterpoint out of flute samples lifted and manipulated in real time. Like Orb Spells, the piece seems to allude to Hindustani music, with the electronics and flute at times interacting like tabla and soloist during the jhala section of a raga. Zylamander for French horn and Max/MSP has a similar jhala-like moment towards the end. The piece, written for Luke Zyla and performed here by Patrick Hughes, moves between a gradually developing, Lydian modal atmosphere and pulsing sections resting on sequences of sixteenth notes.